One of our favorite aspects of the printed paper cup business is collaborating with so many creatives! In the custom printed cup industry, no design is ever the same. And our cups have versatile purposes – from events to ice cream to the local coffee shop. A small-scale neighborhood restaurant with an extensive list of healthy options, Ancolie works with CupPrint to manufacture their custom coffee cups. The restaurant is located in NYC – in the heart of Greenwich Village. Ancolie custom prints its logo on CupPrint’s double-wall paper cups. Ancolie owner and founder Chloe says that “great service, great quality product, and quick turnaround” makes CupPrint an ideal partner. Chloe also relies on CupPrint because our team is “friendly, efficient, and reliable“. By incorporating a light gray background, Ancolie’s designer cup has a clean look. Listing the store logo on the cup, opens a unique marketing channel for Ancolie. We always have so much fun working with this clever company! Thanks Ancolie! 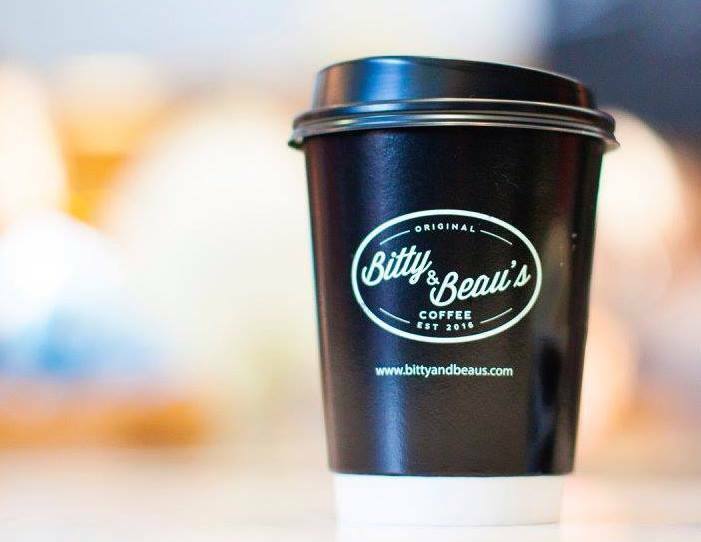 CupPrint client Bitty & Beau’s Coffee is truly one-of-a-kind! The company has received a lot of media attention for its business model. Last year, the coffee shop was highlighted in Southern Living Magazine for their non-traditional business model. CNN named co-owner, Amy Wright, its 2017 Hero of the Year. At Bitty & Beau’s, individuals with IDD have an opportunity to be an active member of the American workforce. Bitty & Beau’s employs individuals with intellectual and developmental disabilities (IDD). By doing so, it creates jobs for a segment of society that is traditionally about 80% unemployed. Amy and her husband, Ben, were inspired to start the coffee shop because of their connection to IDD. Two of their four children, Bitty and Beau, have Down syndrome. The coffee company’s first location was in Wilmington, NC. Amy and Ben opened a second location in Charleston, SC in Fall 2017. What a great company with a great cause! Hayley O’Brien is one of the founders of Busy n’ Buzzed, a boutique paper cup distributor and retailer. Decorating printed paper coffee cups in college inspired Hayley and her co-founders to start Busy n’ Buzzed. The company leverages CupPrint’s digital technology to bolster its business operations. When placing an order for custom printed cups, Hayley and her co-founders submit their colorful custom designs via CupPrint’s online designer service. They then receive their custom coffee paper cup products days later. With CupPrint’s designer service offering, Busy n’ Buzzed avoids unwanted surprises. The designer service web function streamlines cup printing online. With just a few clicks, Hayley can quickly upload her artwork. She then sees what the final product looks like via a 3D digital image and assesses the look of her custom paper cups prior to purchasing. “It was so awesome to see my art jump from the computer screen to life”, says Hayley. CupPrint works with Busy n’ Buzzed to make their designs come to life. This example incorporates travel-related images. So far, CupPrint has produced four custom printed coffee cup designs for Busy n’ Buzzed. All incorporate the artwork submitted by Hayley and her co-founders. These artistic patterns include an urban design that integrates images of mopeds, lipstick, purses, passports, and planes, an orange-centric design, two separate and unique floral designs, and a black and white design with stars. The branded printed cups made for Busy n’ Buzzed are single-wall cups and have fun sleeves. The cups embrace Busy n’ Buzzed’s seemingly say-bye-to-boring theme. CupPrint’s hassle-free service contributes to Busy n’ Buzzed’s successful business operations. As a founder of the Busy n’ Buzzed retailer and distributor, Hayley understands this value. Want to see how Hayley created her customized paper cups with a click? Take a peek!